Another quintessentially English icon under threat of extinction. The number of telephone boxes around the streets has decreased by more than 1/3. I guess the use of cell phones being the major contributor to their demise. This one is one of the more charming designs. A K2 I think (can a UK expert let me know). The more recent K8 design with big glass doors may be more functional but not nearly as lovely to look at. I love perspectives like this, great shot. 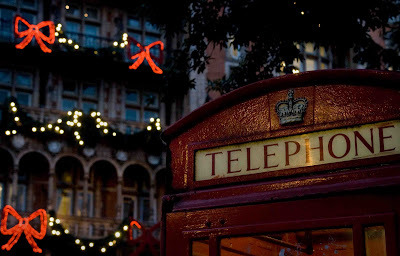 I still love red phone boxes. We so have them here. The new ones just aren't the same. The red is such a magnificent rich colour, smae as the post boxes. You may be photogrpahing history here. Great job on this photo. I love the way you framed it with the decorated building in background. It's a shame such an icon is disappearing! Great composition! I absolutely love this shot. It covers two things I love very much: the UK and Christmas. Well-captured! You have an excellent eye.